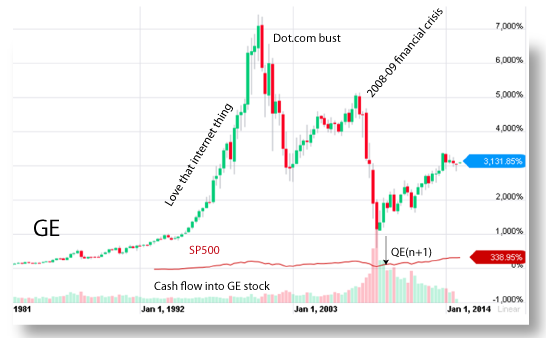 The old saying “So goes GE.. so goes the economy.” From the looks of the amount of money that went to buy GE stock and it relative price increase these last 4 years there is a clear disconnect. If I were to compare QE1+2+3 to a car’s MPG I’d say we got a 10 mpg/gallon Hummer when I really wanted something with an mpg in the mid 30’s. A trillion here and a trillion there, pretty soon, you’re talking real money.